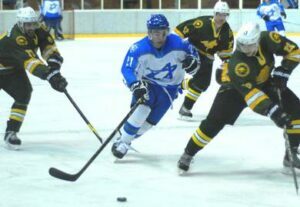 Eliezer Sherbatov became the first ice hockey player from Israel, who played and scored in KHL. It’s a dream come true, but his great story wasn’t always about hockey. “It all begins in Israel when my father wanted me to be a hockey player. I don’t know why he wanted that because back in Israel there was almost no ice hockey at all. So we moved to Canada,” said the son of two Russian-Jewish parents. “I don’t know how my father ends up saying the guy on immigration service that he wanted me to be another Montreal Canadian number 10 Guy Lafleur. But after this, they allowed us to live there,” said Eliezer Sherbatov. Before Sherbatov’s family moved to Israel they lived in Moscow. The capital city of Russia was dangerous in that days so they tried to start a new life. Despite that leaving home didn’t come easy. “My father left absolutely everything in Russia. He comes from Dagestan and he met my mom in Moscow, where my two older brothers were born. In the ‘80s, the mafia had its peak over there and it was a very tough life back there. They decided to move to Israel because we are Jewish so they accepted us. But in Israel, it wasn’t also the greatest life back in that days. It was still war. We chose to move to Canada,” continued Eliezer Sherbatov. He can remember the second move for Sherbatov’s family. He was only two years old, but memories of their start come back easily when he speaks about it. “When we came over to Canada we were poor. I was sleeping in a big box of Marlboro cigarettes. My father finished engineering in Moscow, but in Canada, he had to work in a pizzeria so we had food on the table every day. He is a very smart man and a great businessman with what he did for the family and how he´s brought us up,” explained Sherbatov. When Sherbatov was five he started to play hockey. “And it was horrible,” said the 26-year old forward with a smile. “I started to skate with the whole team, but I recognized I am the worst hockey player of all kids. When my father saw me, he couldn’t believe why he had spent so much money on me and he told my mother to teach me skating,” continued Sherbatov. Living in Canada was for little Sherbatov mostly about hockey, but not for his parents. They had to pay for the house, school for three kids and much more. His father’s job wasn’t enough and his wife had to start helping family too. His father told her how to make a business while she was giving practice to her son and bring more cash to family in the new country. After Sherbatov learned how to skate he had another problem. His height wasn’t enough for a hockey player so he had to prove his skills a lot of better than others. Then came another barrier. “Every single year I was the smallest player. I always had to prove that I was better. There was another thing that I was an Israeli kid and that was a reason for a couple of troubles and things like that. I always had to be the best. If I wouldn’t be the best coaches were asking, why we have him here if we have all the other guys from Montreal to play. That´s why I was every day in the gym with my brother, who is an MMA fighter, and on ice with my mom to try to be better in all things. It’s not the time to go out and have a party like many guys do. It’s dedication from me,” said Sherbatov, who measures 174 cm (5’9”). “It was hard during my career. I didn’t know where I belong. Am I a Canadian? They don’t accept me, they kept saying he is Israeli kid. In Russia, I wanted to be a Russian, but again they didn’t accept me. I speak Russian and English, but I never was truly accepted, because in France, Kazakhstan, the NHL or the KHL everybody wants to improve themselves. So they never accepted me. And I understood that,” continued Sherbatov. After his words, probably many players would finish with hockey for good. But it’s not how Sherbatov works as he tried to get on the KHL level. Even he had to fight with another hard thing. “One of my biggest thing that people don’t know it’s a secret I kept. Only guys from my team know it and I never spoke about this before. I didn’t play hockey for three years because I had a big injury. Back in 2005 I fell and had a bad injury on my left leg. I had an articulation problem and the nerve was damaged and compressed,” said Sherbatov and continued. His next three years were very difficult. He spent more time in a hospital than on the ice. Mostly everything was more about starting to walk properly again than continuing with ice hockey. “And that was so frustrating for me. I had to have one operation then I was trying to get back to hockey, but it didn’t work and the problem came back. The nerve was damaged and the muscle wasn’t working, so I had to have another operation. Then another operation… So I had three surgeries in two years. The doctor told me, I would never play hockey again because I couldn’t even walk normally. My nerve was damaged completely. Now I have no feelings under my knee. I can’t move my foot, it’s called death foot. Funny part of that is, the people considered me the fastest skater out there,” said Sherbatov. Many people would give up, but not Eliezer Sherbatov. His strength is so big, but where does it come from? His devotion to hockey brings him closer to his dreams. He always wanted to play in Kontinental Hockey League (KHL). Now he has played 29 games, where he scored once and had three assists for Slovan Bratislava. But hockey in his home country isn’t still popular enough. He wants to be that player who brings fame to ice hockey in Israel.